OR gate vs. connecting two wires? I am not much of an electrical person but I'm trying to get an idea about it, so keep in mind I have very little background outside of college level electrical physics with calculus, and a strong basis in mathematical logic. I was learning about things you can make with logic gates and came across an adder. I like to give things a try before I look at the answer, so I came up with my own adder. The only difference between my adder and the one in the book I'm reading is that there's an OR gate at the end of their adder for the carry out wire, whereas I just put two wires together. It seems to me that putting two wires together is identical to an OR gate, as there is no electricity out of the node if there's no electricity in, and there is some electricity out of the node if there is some in from either or both sources. My question is: What is the difference between putting two wires together and making a proper OR gate? My guess is that it has something to do with the amount of electricity (current?) on the output wire from the 3-node/OR gate, but my understanding of circuits is a bit rusty. Thanks for your help! What you have to understand is how logic level H and L are represented. Both logic levels H and L are represented by two voltages, i.e. L does NOT mean floating potential or "not connected". 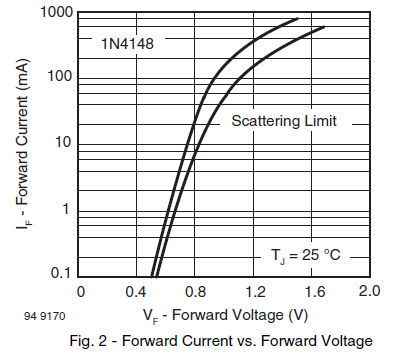 L means the voltage is (close to) 0V, i.e. connection to GND. And of course H is indicated by a higher voltage, e.g. 5V, i.e. connection to positive supply voltage. 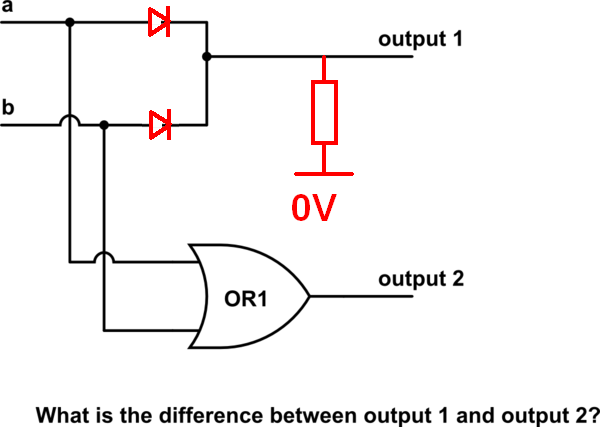 So if two digital outputs have different values (H and L) connecting them would cause a short circuit, not an OR gate. In very most cases in digital logic connecting two outputs together is wrong. so-called open collector (or open drain) outputs which can be AND-wired (similar to what you wanted to do for OR). But then you need an additional pull-up resistor. If R is chosen to cause a current of about 0.1 mA then the volt drop will be about 0.5 volts. 1- What if the two nodes are 'HIGH' but one of them is slightly higher voltage than the other? 2- What if i want to interface this adder with other logic devices ? will it work ? A: No it wont work, for example you cant interface this kind of adder with a CMOS digital device. So you need to build a library of digital modules that all works this way, you need to build your own AND,OR,NOT,NAND gates that all can work with this kind of logic. 3- What if we fixed this problem and represented the 'LOW' state as a 0 volts and the 'HIGH' state as - for example - 5 volts can we still interface this adder with a CMOS logic device? So this kind of logic is only valid if you represent the 'HIGH' and 'LOW' with an LED or a light bulb [something visible] , but its not a practical way to implement complex circuits and storage devices using this kind of logic. It is sometimes done in simple situations like relay logic (in cars, central heating systems etc.) Common features are that logical low is open circuit (not grounded) and input impedances are low (a relay's coil is it's own pull-down resistor). These two features go hand-in-hand. Because teaching examples often use on-off switches as inputs and lamps as outputs, they may work in this fashion regardless of the point they're trying to make. The basic reason for your "wire or" not being a workable option, is that the inputs are not isolated from themselves and from the output. Isolation is critical, for the proper operation of logic circuits. Not the answer you're looking for? Browse other questions tagged logic-gates or ask your own question. 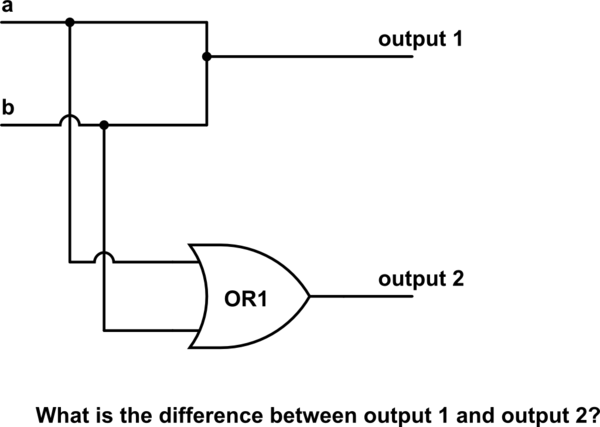 Why does a full adder need an OR gate? How does this SR latch work? How does logisim differ from redstone and real life circuitry? How can I control two motors using only two wires? Two Level Implementation of NOR gate? Why do two reverse diodes represent the logic gate AND? How to find out if a binary number is zero or not using logic gates?